The Sacramento State One Book Program is proud to announce its selection for 2011-2012: The Grace of Silence: A Memoir Pantheon, 2010) (by Michele Norris. As the starred review in Booklist states: “Lauded journalist Norris, cohost for All Things Considered on NPR, intended to write a book analyzing the changing conversation about race in the Obama era. But once she realized that even within her own family, discussions about race were ‘not completely honest,’ she changed course. The result is an investigative family memoir of rare candor and artistry that dramatically reveals essential yet hidden aspects of African American life.” Toni Morrison comments, “The Grace of Silence is an insightful, elegant rendering of how the history of an American family illuminates the history of our country.” Norris, herself, has used the publication of her story to encourage others to tell their family stories. For further information about the book, including an excerpt and reading group guide, please see: https://michele-norris.com/. Michele Norris will be visiting our campus on Thursday, October 20, 2011. Please click on the Programs and Events link to the left for a schedule of the day’s events. President Alexander Gonzalez will convene a campus-wide convocation, introducing Michele Norris, the author of this year’s One Book, The Grace of Silence. LOCATION: All events are held in the University Union Ballroom; discussion groups will be held in the University Union, information will be available at the Lecture. 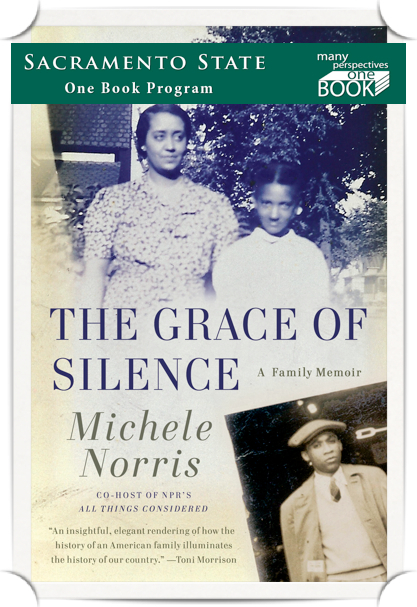 Author Michele Norris will talk about The Grace of Silence: A Memoir. This evening event is free and open to all members of the Sacramento community. There will be a sign language interpreter for the event. Books are available for purchase in advance through the Hornet Bookstore. Click HERE for a creative activity using The Grace of Silence to produce a visual assignment for an exhibit or poster session. Used by permission from Dr. Vanessa Arnaud, Foreign Languages.